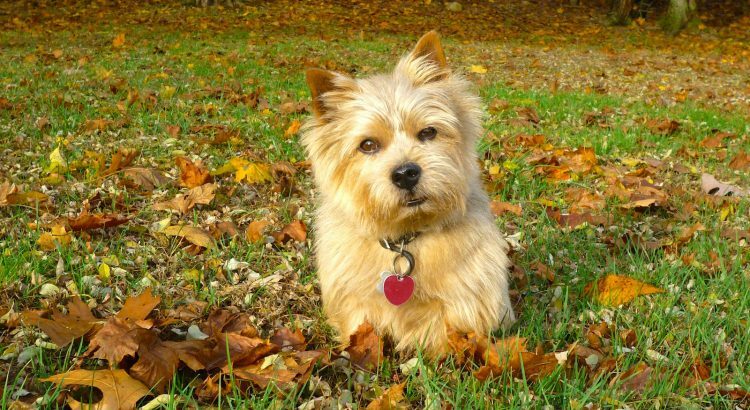 Norwich Terriers are great family pets, but keep them away from smaller animals — these dogs have high prey drives. The Norwich Terrier is the smallest of the working terriers, standing at only 10 inches. These dogs are short, sturdy and strong — with plenty of energy to burn. Norwich Terriers have a slightly foxy-looking expression with small oval-shaped eyes that are set well apart and a wedge-shaped muzzle. Their ears are medium in size and stand erect. The Norwich’s medium-sized tail is held erect. These dogs may have their tails docked at least by half, although this is illegal in some countries. 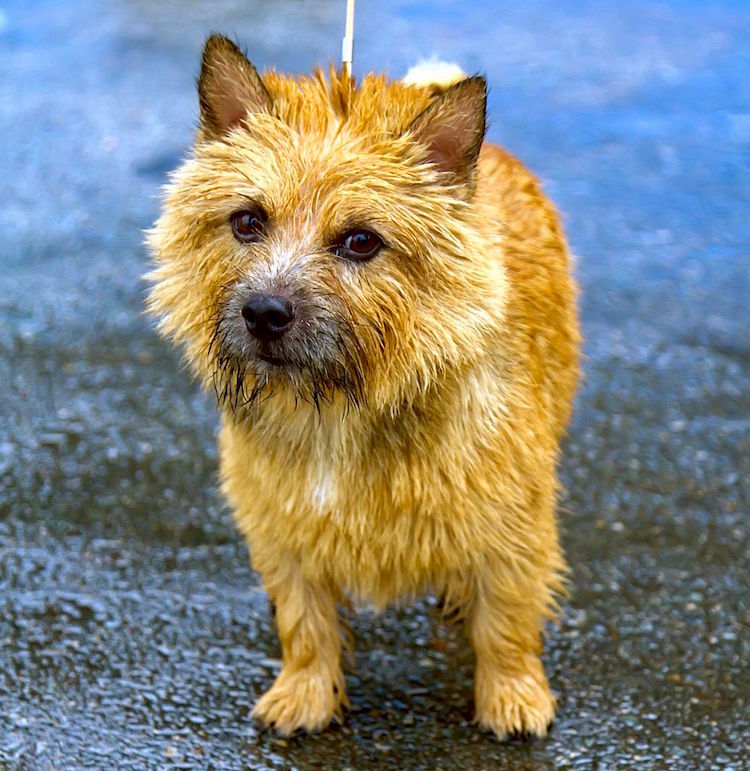 Norwich Terrier coats are straight, wiry and can be red, wheaten, tan, black and tan or grizzle in color. Norwich Terriers were originally bred in England in the early 1800s. 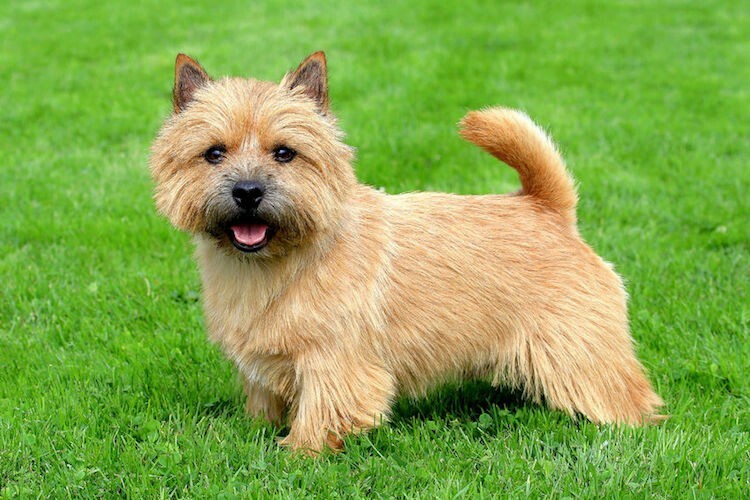 Working terriers from stables in various parts of England, including Norwich, were bred by Frank Roughrider Jones, ultimate resulting in the Cantab Terrier, later renamed the Norwich Terrier. Farmers used Norwich Terriers to help keep fields clear of small predators and in stables to control the rat and mouse population. These dogs also flushed foxes out of foxholes during a hunt, where their small size allowed them to get into the foxholes with ease. In 1914, a Norwich Terrier named Willum was brought to America by Philadelphia sportsman Robert Strawbridge. Willum was a prolific sire before his death at age 14, siring pups in Vermont, New York, Pennsylvania and Virginia. The English Kennel Club formally recognized the Norwich Terrier in 1932, with the American Kennel Club (AKC) following suit in 1936. These dogs are almost universally described as being affectionate, loyal and courageous. Norwich Terriers generally get along well with other pets and children. However, you shouldn’t trust yours near mall animals, such as mice or guinea pigs — those smaller animals will engage your terrier’s prey drive. Norwich Terriers can be stubborn and difficult to house-train. The breed also tends to develop small dog syndrome when not properly trained, which can lead to jealousy and guarding behaviors. The Norwich responds well to positive reinforcement training and will generally perform any trick for a reward. MEDIUM: This dog was bred to work and will need daily exercise. You can accomplish this with a brisk walk. Be sure to make the Norwich heel — in their mind, the pack leader leads. These dogs can be happy in an apartment or small backyard provided they get exercise. LOW: The Norwich has a weather-protective coat that needs infrequent bathing. Light shedders, these dogs should be combed or brushed once a week, with more in shedding seasons. Norwich coats also need stripping, usually, so let an experienced groomer do this. Trim the nails regularly, too. Norwich Terriers can overeat, which may lead to obesity and other medical problems, so measure food out carefully. These dogs are also excellent jumpers and will scale furniture, so guard against leaps that are too high and might cause injury. Many Norwich Terriers across the country need good homes. Some are purebreds, so you can adopt one instead of going through a breeder. Start your search here. If you do contact a breeder, though, please at least familiarize yourself with the classic puppy mill warning signs and ask for health clearances on the dogs when you tour the property. A good breeder will have this information readily available.